Improvements or corrections to a system are usually made after experience gained, user feedback or maybe problem or it could be a simpler way to do it. It is normal evolution in Aquaponics to make things better, easier and most important reliable. Area of problem that I suspected in earlier CHOP system is the water feed to growbed which is using gravity overflow from fish tank and the returning water from sump tank. This arrangement is not an easy way to control constant flow for growbed operation. I did experiment with this style of water feed and I found it quite challenging to get right over long period of time. So with this problem in mind, CHOP 2 was made which eliminate all those that I mentioned earlier. Diagram below is a simplified schematic of CHOP 2 and it is self explanatory. CHOP 2 has a sump tank where a single pump located, output from the pump is split one part to growbeds the other to fish tank. The growbed return to sump with normal bell siphon arrangement and the fish tank return via an overflow keeping the tank height constant. That's about it the basic CHOP 2, obviously you can make it more complex by adding more tanks or some sort of additional filters here and there but above is the baseline of CHOP 2. Now where do this system derived from, please refer below. 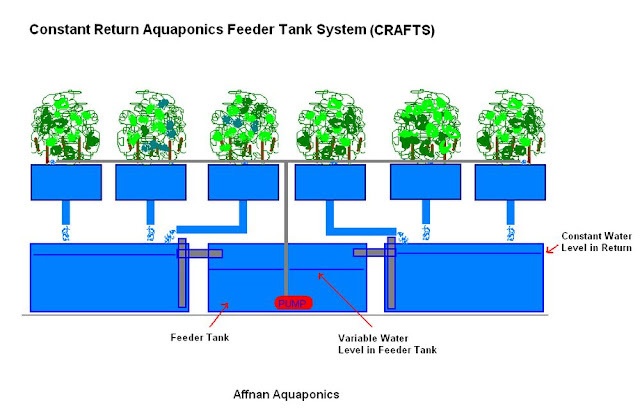 Most Aquaponics system are derived from somewhere, CHOP 2 is no exception above diagram show a simple Growbed over a fish tank in this case a sump tank and a separate loop feeding a larger fish tank. This kind or arrangement is normal if you want to put an aquarium further away from the system. What ever the system you choose to make it'll depend on your site installation. If you asked my honest opinion between CHOP & CHOP 2 then I will say CHOP 2 because it is an improvement over the older design. Between CHOP 2 and CRAFTS then it will depend on the space you have. If you have ample space CHOP 2 is more suitable, if space is the limiting factor then CRAFT or even Growbed over a fish tank is the way to go.